The Society for Marketing and Professional Services' Philadelphia Chapter recently held their 2016 Marketing Communications Awards. Array Architects was lauded with two SMPS awards highlighting their digital contributions to enhancing the firm's brand awareness. The Society for Marketing and Professional Services (SMPS) recognizes the contributions of marketing professionals from the Architecture, Engineering and Construction industry across the US. Both national and chapter awards programs encourage industry firms to showcase the marketing and graphics pieces they have created throughout the year. Array Architects has taken home awards from the Philadelphia chapter in 2015 and 2016. In 2015, the team earned a first-place finish for their holiday piece. This year, at SMPS Philadelphia's ceremony, the team again took home a first-place award. Another submission received an honorable mention. Array earned a first-place award for a promotional campaign publicizing the firm's expertise in Pediatric Healthcare Design. This campaign combined e-blasts embedded with blogs, thought leadership, podcasts and videos. This three-part e-blast campaign is sent to prospective healthcare clients to educate them about Array’s expertise as trusted advisors on planning and design initiatives. The team designed the pediatrics campaign after evaluating web visitor and Google Trends, as well as discussing with Array’s experts what the market trends, developments in care delivery models and current projects reveal about the service line. After identifying pediatrics as a service line for a campaign, the team collected content (culling existing blogs and other media; developing custom pieces) and determined a recipient list based on role and interest. The firm's investment in this campaign not only served as a general get-to-know-Array-better tool, but also helped the firm align marketing efforts to clients most interested in specific services. This entry garnered judges' comments such as, "Consistent messaging, yet creativity also evident." The firm's team also submitted an internal video series developed to educate all firm employees about new procedures created to increase project team clarity and efficiency from inception through close-out of each of the firm's healthcare design endeavors. The team was awarded an honorable mention for this series, which also served as a way to introduce firm leadership across all offices in a fun and upbeat way. The videos, which serve as both a training tool for new employees and a resource when staff transition into a new role within the company, provide a clear understanding of internal process changes and the reasons behind them, including each step and expected outcome. As these new processes affect everyone's daily responsibilities, 100% staff understanding is imperative. Array's in-house videographer modeled the internal video library (comprised of training and project reference videos) after Array’s extensive external video library. The external library promotes Array’s project work, values and thought leadership; and is often a way for new clients to ‘pre-meet’ firm leaders. The internal library allows staff to reap the same benefits from internal communications that clients get from Array’s external communication channel. Transparency and communication are key in firm operations, including internal and external marketing content. This entry earned judges' comments such as, "Beautiful piece with clearly stated messages." 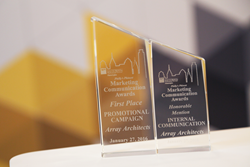 Array Architects is proud of the continuing and increasing brand awareness developing outside the firm. Receiving recognition from organizations such as SMPS validates the direction the firm is taking with graphic design and marketing efforts. "Having a highly-talented and creative graphic design and marketing team has helped raise our firm's profile far beyond what we could have imagined. As evidenced by the recent awards, the team creates such significant value for the firm [that] they are viewed as an integral part of our firm's success," stated Array's CEO Carl Davis. Since 1983, Array Architects has been recognized as one of the nation’s leaders in healthcare facilities design and offers a full complement of knowledge-based services, including planning, architecture, interior design and advisory services from eight office locations. The firm's devotion to a healthcare-exclusive practice springs from a strong belief in the power of design to improve patient outcomes, maximize operational efficiencies, increase staff satisfaction and provide remarkable results for clients.